Home MMA News Kamaru Usman Defeats Rafael Dos Anjos Via Unanimous Decision! Kamaru Usman Defeats Rafael Dos Anjos Via Unanimous Decision! Kamaru Usman Won Rafael Dos Anjos At The Main Event Of TUF 28, Great Fight! TUF (The Ultimate Fighter) 28 Finale takes place inside Pearl Theater at Palms Casino Resort in Las Vegas, Nevada. The main event of the evening brings the Welterweight battle between the former UFC Lightweight champion Rafael dos Anjos and The Ultimate Fighter 21 Welterweight tournament winner Kamaru Usman. Body kick Kamaru Usman. Right hand, he ducks in for a single leg. Both fighters are on the fence, trading knees to the body, dos Anjos gets out with an elbow. 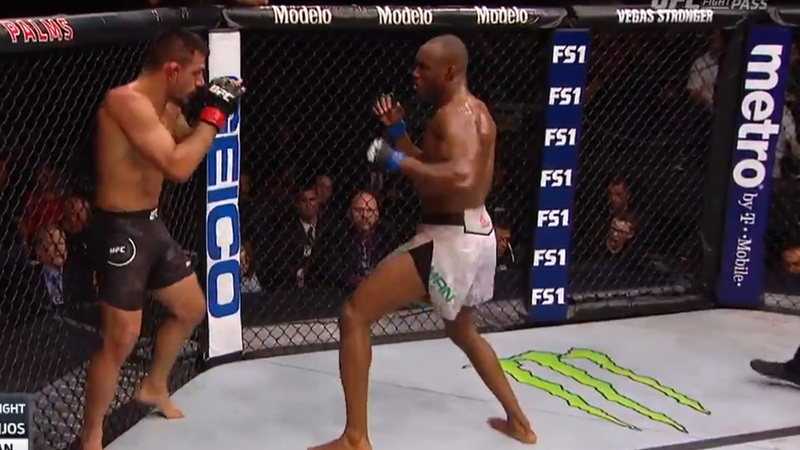 Good exchange, Usman with a right hook and he shoots off “RDA’s” low kick to the half guard. What a fight, great counter! Dos Anjos gets up but receives a knee on the fence. Clinch shots, Usman goes for a single leg but changes his mind. Knees and elbow in the clinch, then fighters separate. Head kick attempt Usman. Head kick dos Anjos, followed by a low kick. Jumping knee, but Usman shoots in. “Nigerian Nightmare” changes levels effectively. Elbow dos Anjos. Usman Takes Dos Anjos Down In The Half-Guard! Strikes to the head and body Usman, while dos Anjos lands an up-kick! The end of the round, probably victory by Kamaru Usman. Excellent left hands from dos Anjos. Leg kick, but Usman responds with a head kick. Kamaru shoots on the fence again and delivers an elbow. Usman separates for the moment but he ducks back in with good body shot. Dos Anjos defends, and fighters continue to trade clinch shots. Good single leg into guard. But now dos Anjos delivers elbows off the back. What a match! Elbows Usman. Dos Anjos goes for a Kimura, and now he tries to sweep Usman and get back up. Usman replies with an elbow of the top. Dos Anjos lands an elbow on the break and now he attacks. Fighters trading shots once again! The end of the round, very hard to score. What a low kick from dos Anjos to open the round! Usman pushes him to the fence again. “Nigerian Nightmare” uses the strategy similar to Colby Covington from RDA’s last fight. Body kick left hand “RDA”, Usman replies. Usman With A Takedown Again! Dos Anjos gets up but receives punishment along the way. Heavy Right Hand Kamaru Usman!!! Usman controls dos Anjos on the fence and he goes for a takedown again. Dos Anjos with a Kimura attempt but ends up on his knees. He looks for a takedown too, two minutes until the end of the round. Usman counters takedown attempt, now the Brazilian is on his knees. Dos Anjos gets up but he is still pressed against the cage. Good knees and body shots. Head kick from dos Anjos! Straight left dos Anjos, right cross Usman, what an exchange. Right-hand jab from Usman. It’s the round for Kamaru Usman! Dos Anjos misses a head kick. Straight left, but Kamaru delivers a great uppercut. Dos Anjos with two leg kicks, Usman counters with a punch. Elbow right hand “The Nigerian Nightmare”. Left Hook And Takedown For Usman Again! Usman is dominating at the moment! Dos Anjos goes on his knees, then tries to defend with a half guard. Butterfly guard but Usman passes to half and trades shots. Looks like he has good skills on the ground. Dos Anjos works his way to the feet. But Usman won’t let him get up, more elbows and punches! Right hands Usman. Dos Anjos again desperately goes for a deep half guard but receives a barrage of hammer fists. Now he adds elbows! This is the best round for Kamaru Usman since the beginning of the match! If dos Anjos doesn’t knock him out in the fifth, he’ll win! Usman lands a combo and also tries an axe kick. Dos Anjos receives multiple punches to the face on the fence. The Brazilian backs up. Hook Usman, dos Anjos has problems getting back on his feet. Uppercuts Usman, elbow dos Anjos. Usman Changes Levels And Executes Another Takedown! Bad guillotine attempt from dos Anjos. Usman punishes him with hammer fists and elbows. Now dos Anjos lands an elbow off his back. Not much action from dos Anjos in this round, I’d say 10-9 Kamaru Usman. 190 strikes landed. 11 takedowns. Rafael dos Anjos drops to 28-11 MMA, 17-9 UFC, while Kamaru Usman improves his score to 14-1 MMA, 9-0 UFC.